I did say that I wasn't going to begin with Project of the Month until January. But what's a girl to do when she spots this? 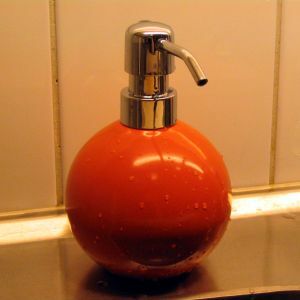 My old soap pump leaks and I've wanted to replace it, but hadn't seen anything that would fit the planned kitchen colour scheme (dark chocolate, oranges and lemons). Plus the white cupboards, stainless steel and wood surfaces, of course, but they are the background, not the main theme. It's a small improvement, but it is an improvement and that's what counts.